Elie Wiesel has long walked the tightrope between pious pronouncements of universal Jewish conscience and unabashed political advocacy. He’s been trying to have it both ways for years, but it seems to me that his balancing act is becoming more and more transparent. If this wasn’t enough, now I read on Max Blumenthal’s blog that Wiesel’s foundation received $500,000.00 for one speech he delivered at the church of fundamentalist Christian Zionist John Hagee (whom he referred to as “my dear pastor.”) Yes, this is the same John Hagee who publicly sermonized that Hitler was sent by God to create the Holocaust so that Jews would emigrate to Israel. It’s simply astonishing to me that so many Jewish leaders are perfectly willing to cozy up to the likes of Hagee even after it has become so patently clear that his views are way off the rails. 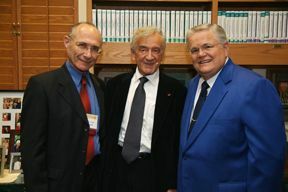 (That’s Wiesel, above, with Hagee, right, and Israeli minister Uzi Landau, left). As far as I’m concerned, Justice Richard Goldstone is precisely the kind of courageous Jewish moral hero that Wiesel himself purports to be: someone committed to advocating for universal human rights even when doing so might mean holding our own community painfully to account. As for Wiesel, I’m finding his words and actions increasingly craven. No one begrudges him his opinions – but it’s time he dropped the pretense that he’s somehow beyond the political fray. This entry was posted in Christianity, Genocide, Holocaust, Interfaith, Israel, Politics, Zionism on February 11, 2010 by Rabbi Brant Rosen. Brant, you are absolutely right on. Thank you for saying this. Regarding Hagee’s statements about the Holocaust, he isn’t saying anything that hasn’t been said by prominent Rabbis and other Jewish thinkers in the past. The first Ashkenazic Chief Rabbi of Israel, Avraham Yitzhak HaKohen Kook, looked at the unfolding of Jewish, and indeed world history, as a revealing of G-d’s plan for the Jewish people and humanity. This is based in large part in his deep knowledge of Kabbalah. In his seminal work “Orot” (lights) which came out in the early 1920’s, he applies an analysis based on the belief that there is a divinely coherent plan to the meaning of the horrors of the First World War. Rav Kook passed away in 1935, before the Holocaust, but his students developed his thought regarding the Second World War, the Holocaust and the rise of the state of Israel and the “Kibbutz Galuyot” (ingathering of the exiles). Obviously, some people don’t like theories of this type. It involves questions of man’s freedom of choice vs. G-d’s intervention in the world, the suffering the righteous, whether history is indeed deterministic and the like. But of course, reconciling belief in a loving G-d with the existence of suffering is a problem for ANY religiously believing person, so attempting to understand mass upheavals like wars and the Holocaust can give someone the tools to cope with otherwise events that can drive other people away from faith entirely. Speaking personally, I find this kind of theology morally repugnant. Based on his writings on the subject of God after the Holocaust, its clear that Wiesel would too. That makes his relationship with Hagee even more troubling. BTW: Hagee also believes that at the end of days, the final earthly battle described in the Book of Revelation will come to pass, resulting in the death of scores of Jewish Israeli citizens and the Second Coming of Jesus Christ. Do you think Rav Kook and his students would agree with this as well? Wiesel has been such a disappointment for many years now. I have always been moved by His eloquent words about not standing by while others are oppressed, like the inspiring words of his speech at the Nobel Peace Prize ceremony – Neutrality helps the oppressor, never the victim. Silence encourages the tormentors, not the tormented.” The problem is that his actions contradict his beautiful words. He has been totally silent on issues of Palestinian suffering even avoiding making mild statements about violations of the human rights of Palestinians. This moral failure along with his support of Israeli government policy as in his last two public pronouncements on Iran and Goldstone make it clear that he is has lost his claim to moral leadership. What a terrible disappointment this is to so many of us and what a loss to the Jewish people! The man who symbolizes the Holocaust has taken on being a mouthpiece for the Israeli government. Personally I am so grateful for Judge Goldstone even if in Wiesel’s opinion he has committed a crime against the Jewish People. Wiesel’s personal witness as a Holocaust survivor will always be important, but he has lost any claim to moral integrity and leadership. I hate to heap criticism on Elie Wiesel, but I’m beginning to think he has become a victim of his own fame. Like other humble people who have found themselves receiving great adulation, he seems to have decided that he can say or do anything he wishes and it’s okay. There is surely an absence of clear thinking in this pronouncement. Like I said, a lot of people don’t like this approach. On the other hand, those who don’t also are forced to accept other premises that others find morally repugnant instead, i.e. that the suffering of individuals and Jews as a people is essentially a “coincidence” or “bad luck” and that G-d is indifferent to it and that there is no ultimate meaning to it. Of course, a close reading of the TANACH (Bible)- particularly that of the Biblical Prophets and the Book of Iyov (Job) and the Rabbinical writings of the Mishna-Talmud period show a lot of grappling with these problems, starting with the prophecy that Avraham Avinu (the Patriarch Abraham) is given in which he is told that his decedents will become slaves in Egypt for hundreds of years, so this is not a new problem, yet Jews have accepted an outlook similar to that of Rav Kook’s for millenia and found it in some way comforting, giving the strength to put up with the suffering of the Galut (Exile) for centuries. Regarding Hagee and his theology-I frankly don’t know anything about him. Making alliances with fundamentalist Christians can be problematic if they have an overt or covert plan to carry out missionary activity in Israel. However, leaving this aside, I don’t care what his theological views of the Jews are as long as he helps today. I once read about a Polish Righteous Gentile who saved Jews in the Holocaust. He admitted he was an antisemite and that, as a good Catholic, he believed the Jews were going to go to hell, but it was his Christian duty to help the persecuted. What do I care what his motivation was as long as he did what had to be done? My issue is not whether or not I personally agree with Hagee’s theology – the issue is that Wiesel is clearly willing to ally himself with someone whose world view is so diametrically opposed to his own. Your example of the righteous Polish gentile is interesting, but I can’t see how it is relevant. In that case, we had a Christian individual whose ultimate goal was, in your words, to help the persecuted. In the present case, we have a religious movement (Christian Zionists) that unconditionally supports Israeli government policies that deprive Palestinians of their basic human rights. And why? Because their ultimate goal is to wipe out non-believers and facilitate the second coming of Christ. I understand that sometimes we have to ally ourselves with folks who might be doing the right thing for the wrong reasons. That’s simply not the case here. Not by a long shot. This is a brave post. There is an untouchability to people like Wiesel, which is frustrating. The man has been pretty much THE hegemonizer of Holocaust narratives in the past few decades, which is dangerous because he has always very much been a proponent of this dangerous theologizing about the “meaning” of the Holocaust, as well as the Holocaust as a justification for every Israeli policy ever. If we want to challenge both ideas, and to broaden our understanding of the “meaning” of the Holocaust, then we need to be willing to challenge him. Because otherwise his view will remain the dominant one. There is nothing wrong with Wiesel. Your problem is that he doesn’t agree with you. He sees things differently. For many of us there is no contradiction with speaking out about human rights and lessons of the Holocaust and at the same time calling the Goldstone report a “crime against the Jewish People”. And Rabbi Rosen, that is his opinion, he’s not claiming to speak on behalf of the Jewish People. Mr. Walt you slander Elie Wiesel when you say “He has been totally silent on issues of Palestinian suffering”. This is not at all true. He hasn’t been silent -he just doesn’t see it your way. Many serious people can acknowledge Palestinian suffering, be very serious about human rights, and still be against Goldstone and supportive of Israel. You shouldn’t insist that this is a contradiction. With due respect, it’s naive of you to claim that Elie Wiesel is only “expressing his opinion” when he makes public pronouncements. He knows full well that he is widely regarded as one of the most prominent Jewish spokespeople in the world – and that when he invokes “crimes against the Jewish people” his words will be given far greater weight than simply one Jew’s personal point of view. Regarding the (somewhat inscrutable) Wiesel quote you cite: I read nothing that in any way addressed Israel’s culpability in Palestinian suffering. It’s difficult, if not impossible, to claim that Israel is innocent of violating Palestinian human rights on some level. As someone who purports to bear witness against human rights, I believe Wiesel’s total silence on this issue is simply disingenuous. Eli Weisel seems to be correct most of the time. He is correct this time also. One of the few who actually deserves his Nobel Peace Prize. Let mention some who don’t: Carter, Arafat & Tutu. I am not Jewish. I am woefully ignorant of the complexities in Israeli-Palestinian relationships…I see the violence and it just adds to the despair I feel as a human, an animal advocate, an environmental advocate, a peace advocate, living in the rural South of the U.S. steeped in ideals I abhor and stunned by the seeming gross indifference in the students I teach at a small, state, liberal arts university…students who are supposed to be the future…scary. I have been seriously questioning why bother? Why fight for peace, compassionate living, tolerance, health care reform, education reform, environmental well-being…it seems pointless. SO this morning I recalled Wiesel’s interview w/ Ted Koppel, where he said something along the lines of he doesn’t fight hate to win, but b/c it’s the right thing to do. I read a speech of his this morning were he insisted all war is wrong, that silence and sitting by is wrong. I sought out his words for inspiration…and yet in my online searching today, I find NO words of Wiesel’s that stand against Israeli violence toward the Palestinians. I find myself returning to my original thinking, why bother? b/c if THE champion of non-violence and tolerance and “humanity” (his foundation “for humanity”) can imply by his silence that in fact SOME violence and hate is ok if not justified, then what?